Your favorite player swings and misses. “Strike three,” signals the umpire. While the disgusted batter drops his head and walks dejectedly back towards his dugout, a fan yells, “Run! He dropped the ball!” The batter now takes off in a half sprint to first base. Too late, the home plate umpire has already signaled out. Although you won’t find this word in the rulebook, umpires and fans refer to this circumstance as desertion. But when exactly is he declared out? Under Official Baseball Rules (and NCAA 7-11u), a batter (batter-runner) who shows no effort to advance to first base on a third strike not caught shall be declared out when he leaves the dirt circle around home plate. 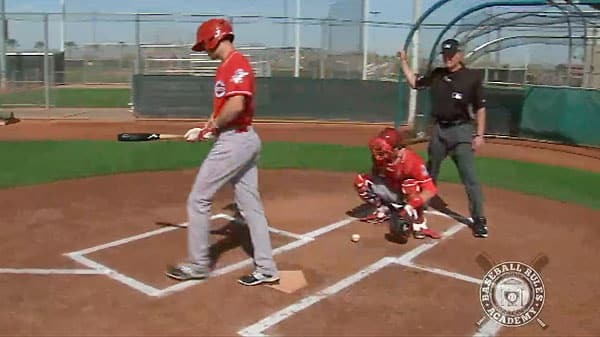 The same call is made on a batter who “lingers” at home plate, removing batting gloves or protective shin guard. The rules recognize the variation in size and shape of the dirt circles surrounding home in different ball parks (many amateur fields do not have these circles marked) and allow the home plate umpire to make a judgement call as to whether the batter-runner abandons his effort to advance to first base. An unusual play might occur if the batter is out on strike three and the ball goes to the screen. The runner on third base runs towards home and the batter-runner (let’s say he is right handed) backs up several steps and ends up on the grass outside the dirt circle. The batter-runner then runs to first base where he beats the throw and is called safe. The defensive manager might argue that the batter-runner should be called out for abandoning his efforts to advance to first by stepping outside the dirt circle. The umpire would have to decide whether the batter-runner was abandoning his effort to advance to first or was he trying to clear out of the home plate area to allow the play at home to happen. NOTE: If the batter does not clear the area for a play at the plate, he could be called out for offensive interference. High School (NFHS) rules, gives more leeway to the batter-runner. The batter has until he enters the dugout to run to first base. Once the batter steps into the bench or dugout area he is declared out (NFHS 8-4-1i). The NFHS rules also address when this rule happens with two outs. In this case, the batter-runner has until all defensive players leave fair territory to try for first base.